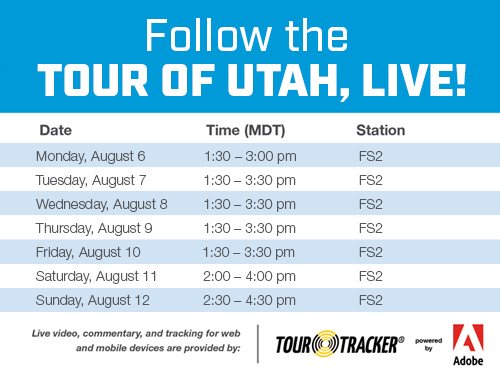 Broadcast partner FOX Sports Network (FSN) will provide a total of 21 hours of national programming this year for the Tour of Utah, including 10 hours of live coverage. The Tour Tracker® app for web and mobile devices will provide start-to-finish live video, commentary, and tracking. Nightly race recap program at 8 pm MDT on KJZZ-TV. Also available on AT&T SportNet; see local listings for time. The Tour Tracker® app for web and mobile devices provides live start to finish video, commentary, and interactive maps and tracking. Download now to watch live on your desktop or your favorite mobile device. For news, information, and offers about the Larry H. Miller Tour of Utah, subscribe to our email newsletter.